Exploring drawing from memory as a basis for generating new works. This winter I have engaged in a practice of drawing figures from memory. This ability to draw from one’s mind’s eye is a skill that was practiced by artists until the 20th century. It subsequently, has fallen out of use with, I believe, the advent of photography. In the 19th century artists engaged in both working from life or “imitative” drawing and memory drawing. The artist, Paul-Emile Lecoq de Boisbaudran, in the 19th century, taught a method of memory drawing that was meant to liberate the artist from strictly working imitatively. He found that memory only retains those things that have produced an effect on the mind and the emotions. Delacroix worked from both methods and felt that both poles were necessary to create great work. Delacroix avidly sketched from life in order to refine his eye and gather a deep understanding of natural phenomena. But conversely, he also felt that all great work of genius derived from the imaginative force that dwells within the artist. It was this subjective force that had the capacity to express the intangible. So his practice entailed sketching from memory fortified by observation and an understanding of nature. In his practice as described in his Journal, Delacroix would sketch freely from memory seeking to manifest the imaginative force and energy of the image as well as the emotional content through multiple rapid sketches. The energy of the action and the heightened emotion are always captured in the initial engagement with the idea. Delacroix fed on that furious passion and sought to maintain that force even in his larger work. Although the larger paintings called for immense preparation and craftsmanship over long periods of time, he desired that they should maintain the feeling of the “larger effect” that a sketch visualizes so acutely while suppressing the details. In the Journal, Delacroix describes his method to get the best of both worlds- the dynamism of the initial sketch heightened with the accuracy and understanding of natural phenomena necessary to carry a larger piece to completion. So to begin with, Delacroix would choose a theme to activate his imagination. This was the “visioning” process. Next, he would then sketch freely and spontaneously, not concerning himself with accuracy but with the emotionally charged interplay of figure, objects and space. After rendering multiple sketches based on his subject, he would select a sketch that contained all the elements that he was searching for. He would then take this sketch and place a sheet of tracing paper over it. Next came the process of “refining”. Using the tracing paper on top, he would re-work the figure and bring it into context, taking exaggerations and inaccuracies and bring them into a harmonized relationship that reflected nature. 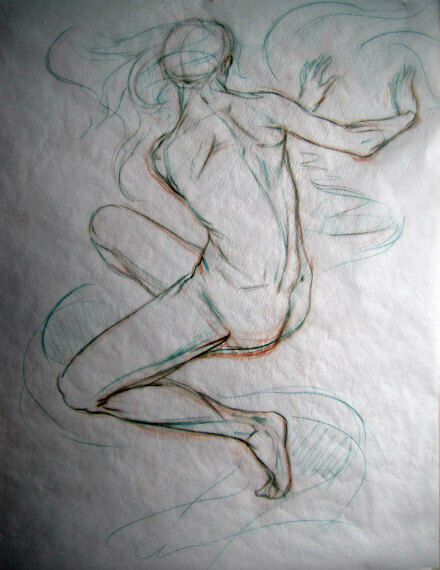 If he was not satisfied with the re-visioning of the figure, he was in a position to begin again from the initial sketch. I found this process surprisingly easy to do. When one draws from one’s memory, one is apt to exaggerate the action to try to elicit an emotional response. This is a necessary step and is key to amplifying the image. But it also needs to be tempered by truthfulness to nature. By containing some of the energy through refining the drawing, one actually allows the figure to hold some of that exaggerated energy within. By holding power in reserve, one adds force to the image that is not obvious. It is analogous to a ‘boiling pot with the lid on’. And this is what you want- not all the energy spilled out at once, but seething just below the surface. Delacroix’s ‘Jacob Wrestling the Angel’ is the culmination of years of practice in this method. The images in this blog post follow Delacroix’s practice. 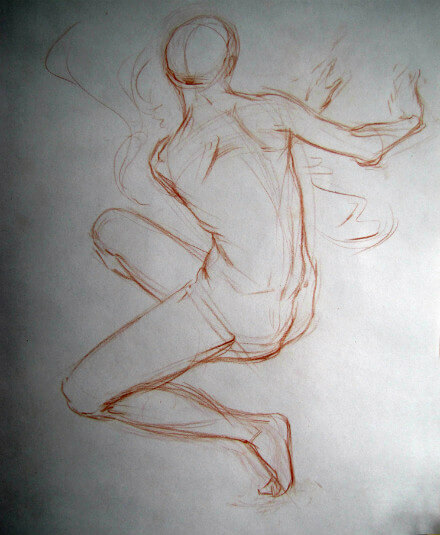 The red sketch is the initial rapid drawing. 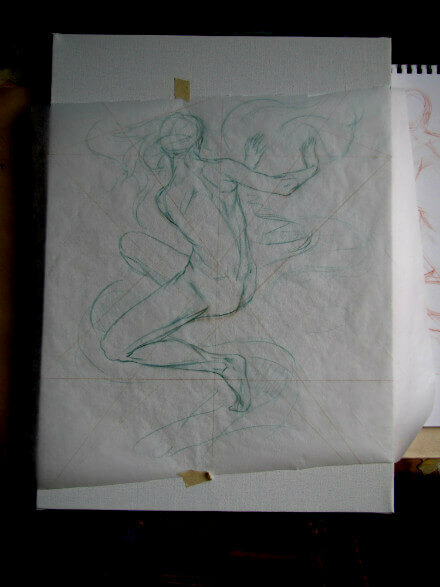 The green sketch is on the tracing paper. You can see how I tempered some of my exaggerations and redefined the drawing. In the last image, I have placed my tracing paper on the canvas to align it with the rabatment lines to give it extra force and a relationship to the outside edges of the canvas. 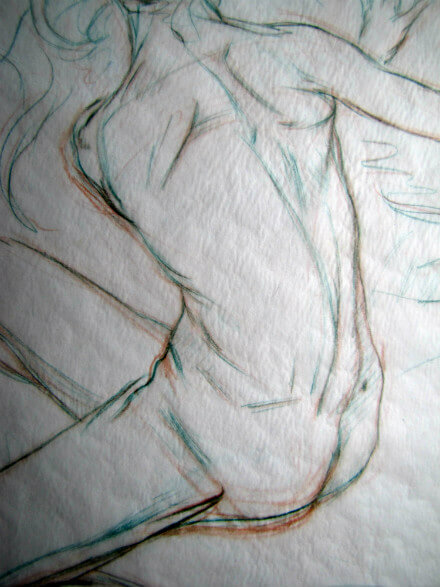 One could then transfer it, but I tend to redraw in paint as this is a more fluid method for me to work.